GANA HASTA $1000 CON ¿QUIEN SABE MÁS? Escucha a El Bueno, La Mala, y El Feo de Lunes a Viernes de 5am a 10am a traves de La Buena 92.1 FM para tu oportunidad de ganar. IMPROVE YOUR OPPORTUNITIES TO WIN. INVALID WHERE PROHIBITED. Date of participation: Between March 11 to April 19, 2019 around 7AM PST. in the areas of Los Angeles, Bay Area, Phoenix, Dallas, Las Vegas, Fresno, Chicago, San Diego, Austin, Nashville, Tampa, Denver, Greenville, Albuquerque, Bakersfield, Portland, Eugene, Little Rock, Allentown, Tulsa, Oklahoma, Iowa, Indianapolis, Delaware, Georgetown, Sacramento, Utah, Georgia, Nampa and Wauchula with a Social Security number (SSN) or Tax number (TIN), with valid identification. How to participate: Tune in to El Bueno, La Mala, and El Feo Show at one of the Univision Radio stations, Inc., mentioned above, Monday through Friday around 7AM PST. When the announcer indicates, be the designated call for the opportunity to participate 1(855) 370-3100. The participant will have to answer one (1) or up to three (3) general culture questions for the opportunity to earn up to $ 1000. The participant will have up to five (5) seconds to answer the first question. If the participant answers the first question correctly within five (5) seconds they will earn $ 250, and can continue to the second question. The winner may decide to continue to the next question or staying with the amount earned of $250. If the the answer is incorrect or the time limit expires, they will lose the money and their participation will end. In the case that the participant continues to the second question, they will have up to five (5) seconds to respond. If the participant answers the second question correctly within five (5) seconds the prize will increase $250, for a total of $500. The winner may determine to continue to the next question or not to continue and remain with the earned amount of $500. If the answer is correct, you can continue to participate by a third question and last question. If the participant answers the third question correctly within five (5) seconds, the prize will increase by $500 and will take a total of $1,000. If the time limit expires or you answer incorrectly, they will lose all the accumulated money. Permitted Participation per person: A person may call unlimitedly, but may be the designated call only once during the participation period. How winner(s) are chosen: The designated call will be determined at random. Selection date: Up to one (1) participant will be chosen daily from Monday to Friday for a total of up to thirty (30) participants selected from March 11 to April 19, 2019, Monday through Friday. How winner(s) are notified: Winners will be notified during the call. 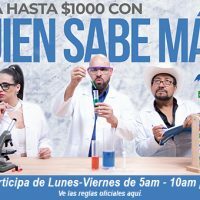 Way and date of collecting the Prize: The sponsor will indicate each winner the date and day on which they may pick up the prize in person at the local Univision Radio office. The winner has two (2) weeks to collect your prize from the day you are notified of being the winner of the prize. Prize(s) and their Approximate Value: The winner will have the opportunity to win $250, $500 or $1,000. The prize approximate total cash value is $30,000. The odds of winning $250 is one in 30, $500 is one in 30, and $1,000 is one in 30 provided by Univision Radio for promotional purposes. All prizes will be awarded in the form of a pre-paid card which is you can use it wherever the Visa® debit card and Accel ™ logos appear. The card is accepted as long as it does not exceed the value available on the card. Additional terms and conditions they can apply. Opportunities to win will depend on the number of participants. Persons in the following categories are not eligible to participate or win a prize: (a) persons who, as of or subsequent to the beginning of the promotion, have been or are employees or agents of the Sponsor, the Co- Sponsor (s), or their respective parent companies, subsidiaries or affiliates or service agencies or independent contractors; (b) persons who are involved in the development, production, distribution of materials, or the selection of the winners of this promotion; and (c) persons who are part of the immediate family of or who live in the same house as any of the persons included in any of the above categories. All Sponsor decisions will be final and binding in all respects. Each winner and each the winner’s guest, if any, may have to sign a release of liability. If the winner results not be eligible; if the winner cannot be notified as determined in these Official Rules; or if the winner does not collects the prize as indicated in these Official Rules, it will be considered as if the winner had rejected the prize and the Sponsor may select a new winner if time permits. To claim awards, winners will be required to provide acceptable identification to the Sponsor and collect prizes such as instructed. Winner (s) cannot substitute the prize for its cash equivalent or for a credit. The prize cannot be replaced if it is lost or stolen. The prize cannot be transferred or transferred by the winner (s). Sponsor reserves the right to substitute at its discretion any or all of the prizes with any item or service of similar or greater value. Sponsor reserves the right to modify or terminate this promotion for any reason including fraud, technical failure or any other factor beyond the control of the Sponsor that damages integrity of the promotion, determined by the Sponsor at its sole discretion. Sponsor may disqualify any person who, in his/her sole discretion, considers that he/she has violated these Official Rules or any other element of the promotion. The participant(s) is(are) in agreement with: (a) being subject to the Official Rules and Sponsor’s decisions, and (b) release and keep in peace and safety the Sponsor, the Co-Sponsor (s) and their respective parent companies, affiliates, stations, subsidiaries, and independent contractors, and their respective directors, officers, employees, and agents, including the advertising and promotion agencies, of any and all liability with respect to the acceptance, possession or use (or misuse) of the prizes and/or participation in the promotion. All taxes (federal, state, and local) will be the sole responsibility of the winner and it is possible that each winner will be required to prepare tax forms. If the winner has received other prizes from the Sponsor during the current year, and if the total value of those prizes exceeds $600, the winner will have to provide Social Security Number or Tax Identification Number to receive the award. These Official Rules are subject to the laws of the State where the Sponsor is located, ignoring the principles of conflict of laws. To obtain the winner list(s) which will be available after the promotion ends, send to “Promotion – Winner List (s)”, to the Sponsor’s address above, a separate envelope directed to yourself with pre-paid postage. To obtain a copy of these Official Rules, send “Promotion – Official Rules” to the address of the Sponsor indicated above, a separate envelope with pre-paid postage and addressed to yourself. In the event that there is online participation: The use of software for the automated entry of participation formats is prohibited. Participation formats made online with multiple email addresses electronic, under multiple identities or through any artifact or device used to participate multiple times will be considered null. If the winner is an online participant, the format of the winner will be considered the winning participation is that which has been sent by the authorized holder of the account of the email that sent the said format. The authorized holder of the email account will be considered as the natural person to whom an email address is assigned by means of the Internet access provider, by a service provider or other organization that is responsible for assigning email addresses or by the domain associated with the email address sent. The Sponsor will not be responsible for the transmission of incorrect or inaccurate information contained in the participation formats, due to technical errors, loss or delay of data transmission, omission, interruption, suppression, defects or failures in the telephone network line, or of the computer equipment, software, or by the impossibility of accessing any online service or site, the impossibility of sending the format of participation, or for any other error or dysfunction, or any damage caused to the computer equipment of the participant or any other person resulting from the download of materials or information or from the participation in this promotion, or for the loss, theft, delay, loss in mail, illegible data of the participation formats or being sent to the wrong place. If this promotion or any network site associated with it (or any portion thereof) will be reached corrupt or not allow entry to the promotion, or if the infection by computer viruses, bugs, manipulation, unauthorized intervention, actions of participants, fraud, technical failures, or Any other cause, which in the opinion of the Sponsor, corrupts or affects the administration, security, impartiality, integrity, or proper operation of this promotion, Sponsor reserves the right, at participant(s) sole discretion, to disqualify any individual involved in such action, and/or to cancel, terminate, modify or suspend this promotion or any portion of it. The attempt, by some participant or of any other individual, of deliberately damaging the online service or the website, as well as the attempt to undermine the legitimate operation of this promotion, will be considered a violation of criminal and civil laws. Sponsor reserves the right to assert its right to claim damages and/or other payment damages in the broadest extent allowed by law.